DTC P0688 & transmission control shut down occurred while driving jeep, no crank in neutral while coasting, parked,no crank in neutral or park. Ignition switch shows hot at wire from start position, starter can be cranked by jumping solenoid, asd relay, starter relay fuel relay and all fuses good, continuity from ECM harness to asd relay good. Recently transmission temperature light had come on,then check engine light,but both had gone off shortly after. Vehicle had a rough kick shift from first to second gear.what do you think ? Computer ? Last edit: 29 Mar 2019 18:25 by Paulpurdue. Check for power at Pins 19 and 28 (connector 3) while the ASD relay is energized. With ignition key on. Battery voltage greater than 10 volts. No voltage sensed at the PCM when the ASD relay is energized for 3.075 seconds. Three good trips to clear the MIL. Last edit: 30 Mar 2019 08:33 by Paulpurdue. If the engine does not start, the ASD relay will deactivate in 1.8 seconds. So, make sure to do the test while cranking, or within that amount of time after turning the key on. Verify Fuse 9 is good and that the relay is activating. Do you have power at the injectors and coil? A test light, connected to Battery Positive can be used to check for ASD Relay Control from the PCM. The 5 pin, 12-volt, Automatic Shutdown (ASD). relay is located in the Power Distribution Center(PDC). A 12 volt signal at this input indicates to the PCM that the ASD has been activated. The relay is used to connect the oxygen sensor heater element, ignition coil and fuel injectors to 12 volt + power supply. This input is used only to sense that the ASD relay is energized. If the Powertrain Control Module (PCM.) does not see 12 volts at this input when the ASD should be activated, it will set a Diagnostic Trouble Code (DTC). The ASD relay supplies battery voltage (12+ volts.) to the fuel injectors and ignition coil(s). With certain emissions packages it also supplies 12-volts to the oxygen sensor heating elements. The ground circuit for the coil within the ASD relay is controlled by the Powertrain Control Module (PCM). The PCM operates the ASD relay by switching its ground circuit on and off. - the ignition key is left in the ON position. This is if the engine has not been running for approximately 1.8 seconds. - there is a crankshaft position sensor signal to the PCM that is lower than pre-determined values. Last edit: 30 Mar 2019 11:45 by pole71. No ground in asd relay ( terminal 85 coil grnd in PDC), test light connect to positive terminal. ) with key in crank and run position, no signal to starter relay, fuel pump relay. It's not looking good for the PCM. After that, the only thing left to check is PCM Powers and Grounds. Is this the 4.0L? Or, the 2.4L? I think your picture is of Connector 1. Yup Thad be rite ! Was on phone with brother in law, said that harness was black/ natural, since when is white called natural, i wasted a lot of time, but i learned how's to test electrical problems , still have a lot to learn. Will test the real C3 thanks. Repeated testing on pin 19 & 28 ( test light B neg.) No light signal. Test ( test light B pos.) on pin 3 & 37 back probe, no light signal. Starter relay has light signal in crank position on terminal 85, and asd relay no light signal in crank position ( test light connected to B-). Just to be clear, you did the testing by back-probing the connector while it was CONNECTED to the PCM, correct? If so, verify that you have good powers and grounds to the PCM. Then, I would feel comfortable calling it a bad PCM. Question; how can i back probe the wiring harness to the powertrain control module with harness connected to pcm ? You mean intruding into wire harness at specific wire from wire side of connector ? Then no. Insert a "T" pin, or something similar, into the backside of the connector, parallel to the wire you want to test. 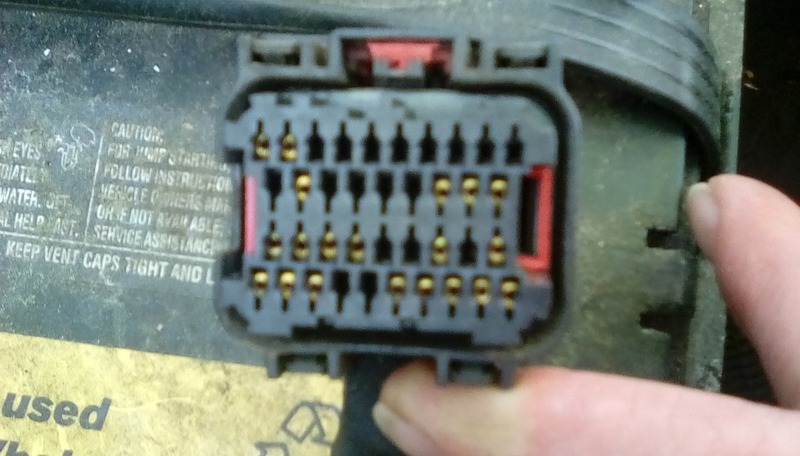 You are not piercing the wire insulation, but reaching into the connector to touch the metal pin terminal that is crimped onto the end of the wire. Be VERY careful to go STRAIGHT in, as you do not want to touch the terminals on either side of the target terminal. Last edit: 31 Mar 2019 19:45 by pole71. "T" pins can be purchased from the sewing section of any department store. Here is another "How to" video. Last edit: 31 Mar 2019 19:39 by pole71.